Today, many homeowners are having energy-efficient windows installed in their homes. Energy-efficient windows are an excellent source of savings. By savings, we don’t just mean on energy. Our energy-efficient windows from Alside offer savings on utility and maintenance costs overall. Since windows are about 80% glass, this component plays a crucial role in energy efficiency. Kroll Construction knows this, as our windows from Alside are made for such feature. Their windows have double-strength glass that is 3 mm thick. This way, the glass is stronger, more protective, and doesn’t break or crack easily. Our ClimaTech® insulated package combines Intercept® Warm-Edge Spacer System, Low-E, and argon gas, which enhances energy efficiency. Vinyl windows are not a popular choice when homeowners are eyeing for energy efficiency. Nonetheless, Alside constructed better grade and more durable vinyl windows to solve this concern. We fusion-welded or heat-welded our replacement windows for a weathertight construction. Moreover, our windows are manufactured with premium vinyl extrusions to ensure long-lasting beauty and performance. The quality of the product is only as good as its installation. A professional window installer seals the deal. Hire a professional window company, such as Kroll Construction. Our team takes pride in quality workmanship and flawless installations. The windows that we install add beauty, value, and functionality to homes. We owe this to our exceptional installers. These are the three elements behind energy-efficient replacement windows in Detroit. 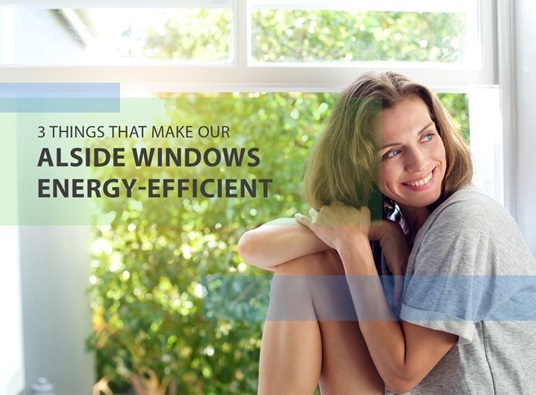 Hopefully, this post encourages you invest in energy-saving windows. Our vinyl windows from Alside will surely make your home more beautiful and efficient. We offer double-hung, casement, bay, bow, awning, picture, garden, and decorative windows. If you need help in choosing the right window replacement in your home, give us a call at (888) 338-6340 today. We’ll be happy to assist you.